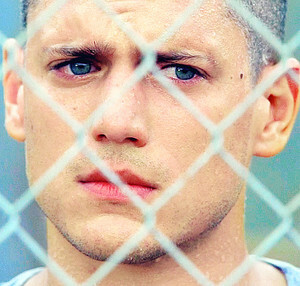 Michael Scofield - Prison Break. Pretty. <3. Wallpaper and background images in the TV Male Characters club tagged: photo michael scofield t-bag prison break theodore bagwell lincoln burrows. This TV Male Characters photo contains vedação de arame, cerca chainlink, and cerca de arame farpado.